Silver jade plant (Crassula arborescens): growing, planting, caring. A Crassula for drought tolerant gardens in warm areas or as a houseplant elsewhere. Crassula arborescens - the silver jade plant - is a species of succulent plant in the Crassulaceae family, endemic to Western South Africa. 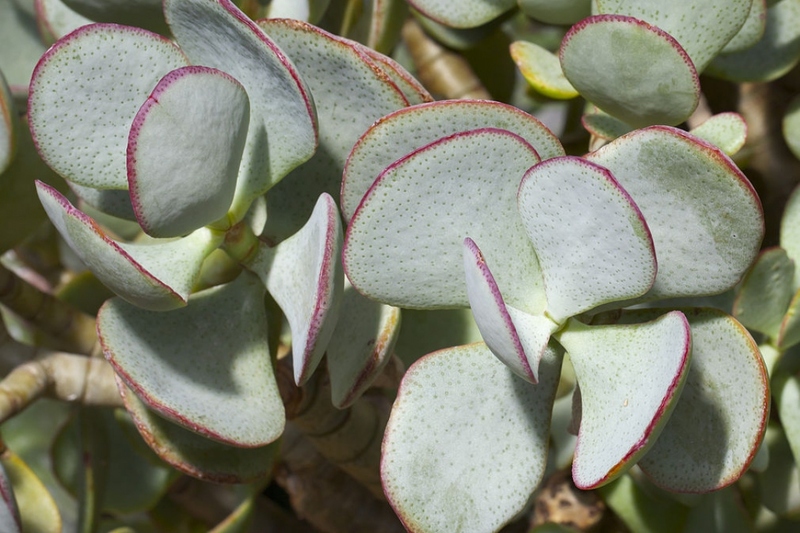 It is a 2 to 4 ft (0.6 to 1.2 m) tall succulent shrub, with round gray "Silver Dollar" leaves and white to pink flowers blooming in winter. When some branches do not good look anymore, or are too old, you can prune, ideally in spring, after flowering. The best way is to cut by hand by breaking the stems gently. Be sure to keep 3 to 5 leaves on each branch, otherwise pruning may weaken it too much. Bring back your crassula inside long before the first cool nights, ideally in a room not too heated so that it "feels" it is winter. It is also on this condition that it will produce small white or pink star-shaped flowers in early spring: a good winter period cool with 5 to 10 ° C at night without artificial light is needed! You will water once a month in winter.